OAKLAND, Calif. -- Kevin Durant established Golden State's defensive energy by swatting away shots early. Eventually, the Warriors got going on the other end as they almost always do. 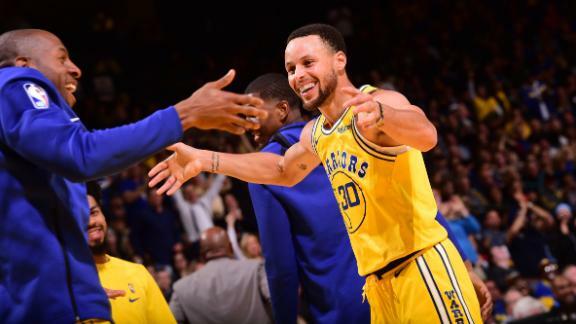 Golden State returned from an impressive 3-1 road trip -- with wins at Houston, Oklahoma City and Minnesota and a loss at San Antonio -- to play its first game at Oracle Arena since a 115-111 flop against lowly Phoenix on March 10. Bogut had seven rebounds and four points -- shooting 1 for 8 -- in nine minutes. And Bogut was greeted exactly how Kerr figured -- with "a raucous reception." "I think our fans recognize that, in many ways, Andrew represented the shift in the Warriors organization and its emphasis on defense," Kerr said. "I think that trade was really kind of the first domino to fall in terms of -- well Steph's drafting was the first one, let's not forget that one -- but shortly thereafter Andrew came over in the trade and there was an organizational shift toward a defensive mindset which I think Mark Jackson implemented and the players started to reflect that philosophy." DeMarcus Cousins leads the Warriors with 19 points, Klay Thompson has 18, and Steph Curry and Kevin Durant record 15 apiece to lead Golden State to a 112-89 win over Indiana.